Book Lots 101-150 - Mike Clum Auctions Inc.
​101. Weldon Kees: 13 small manuscript diaries or day-books, 1939-1954. A fascinating resource for the biography of Kees, these items span from the days before he published his first book of poems until the year of his death in 1955. They contain varying amounts of handwritten material, but taken together, they offer a fascinating record of Kees’s reading and his filmgoing, his daily activities, and they include numerous references to his ongoing work as a painter, a facet of Kees’s career that we are powerfully reminded of when we see in the 1946 day-book that Kees has entered in an address and phone number for Mark Rothko. Other entries focus rather on Kees’s literary side, as this one from December 8, 1946: “4:00-7:00 W. C. Williams party at Park Book Shop” where he notes the presence of “Roethke, . . . Zukofsky, McLeish” and others. The lot includes: A) “Journal of a Trip” dated 15 June 1939, 28 pages of manuscript, with observations of people and talk. B) date book from 1943; entries generally brief, but a section of names and addresses recorded on the pages for March include John Cheever, E E Cummings, Robt Duncan, Theodore Roethke, Jim Agee, C) date book from 1944; entries perhaps on half of the pages; several times mentions reviews or articles he’s been working on. D) date book from 1945; entries present for most weeks, some pages full. E) date book from 1946; entries on most or all pages. May 8: “R + H accepts The Fall of the Magicians.” F) date book from 1947: entries for nearly every day, including several small sketches of paintings he’d done; G) date book for 1948. entries on most pages; Tuesday March 2, “Writing ‘Aspects of Robinson.’” H) date book from 1950: entries for most weeks,. I) diary from 1951: entries for most days. 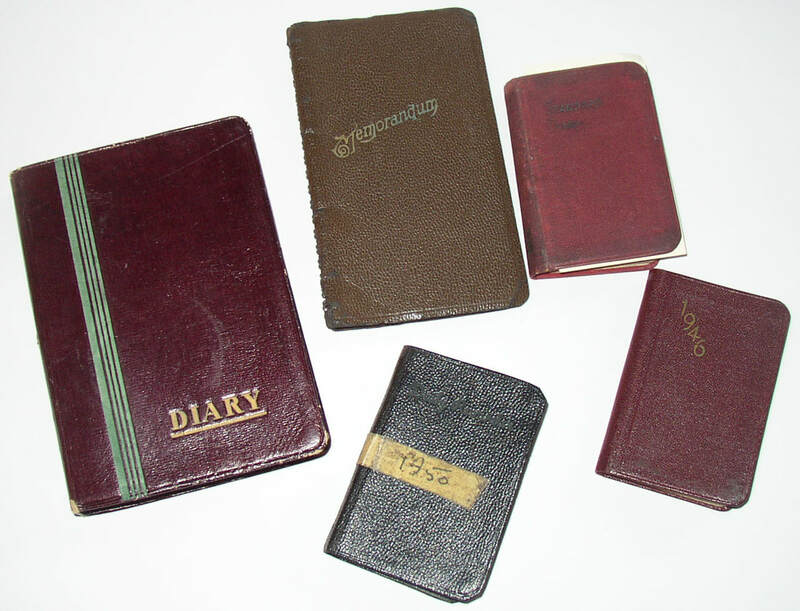 J) Diary from 1952: entries for most days. 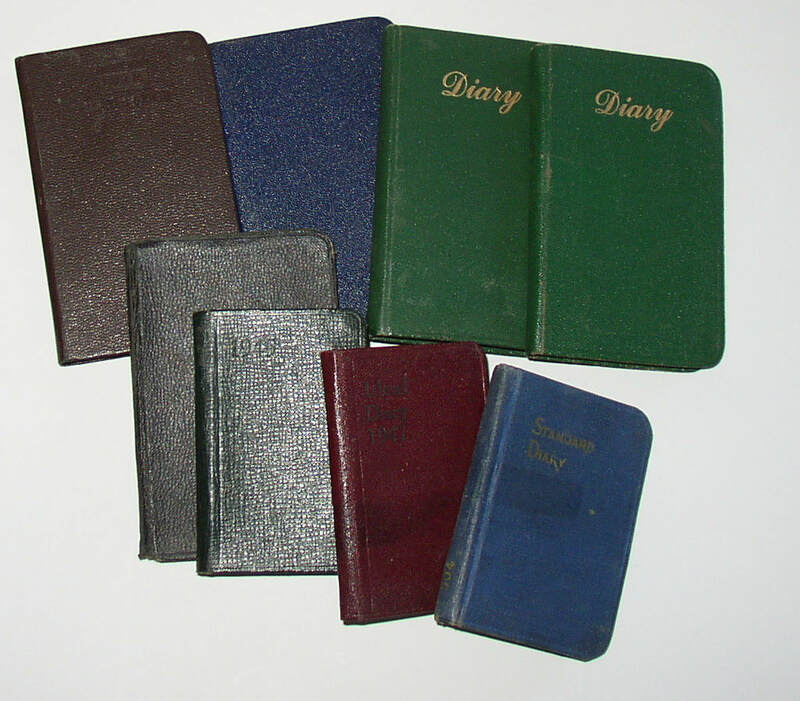 K) diary from 1953: entries for most days; L) diary from 1954, lengthy entries for most days up to July 2; nothing after. ; M) diary dated 1954, but possibly for dates in 1955? extensive entries, where present, but extending only from Jan 1 to Jan 17; otherwise blank. Some entries discuss Kees and Jurgen Rausch’s revisions to their book on Non-Verbal Communication. These little books do not make up a complete record of Kees’s days, but they make a fascinating record as far as they go, and Kees clearly invested more and more time and effort into them as the years went along, writing longer and more detailed entries, in the 1950s books often quite lengthy and detailed. Together they must make up and interesting lot of manuscript material for this mid-century poet and artist, an indispensable resource for Kees’s literal and intellectual biography. Condition: Used; Very Good as a rule. 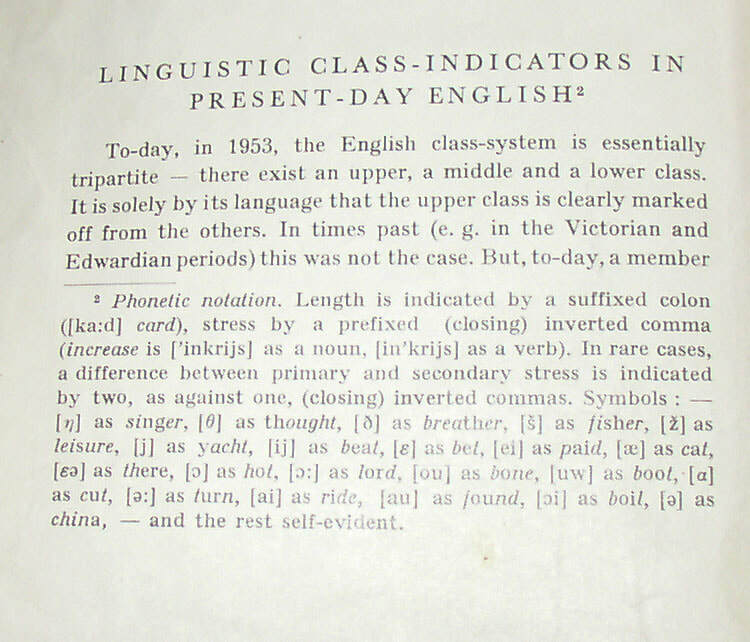 A 1954 offprint from the Finnish academic journal Neuphilologische Mitteilungen, in which Ross attempts to tabulate ways that Upper Class British English (U) speakers have speech patterns that differ from aspirational members of lower classes (non-U), who (essentially) might nevertheless attempt to sound posh. Along the way, Ross notes one such pattern observed in Nancy Mitford’s 1945 novel, The Pursuit of Love. 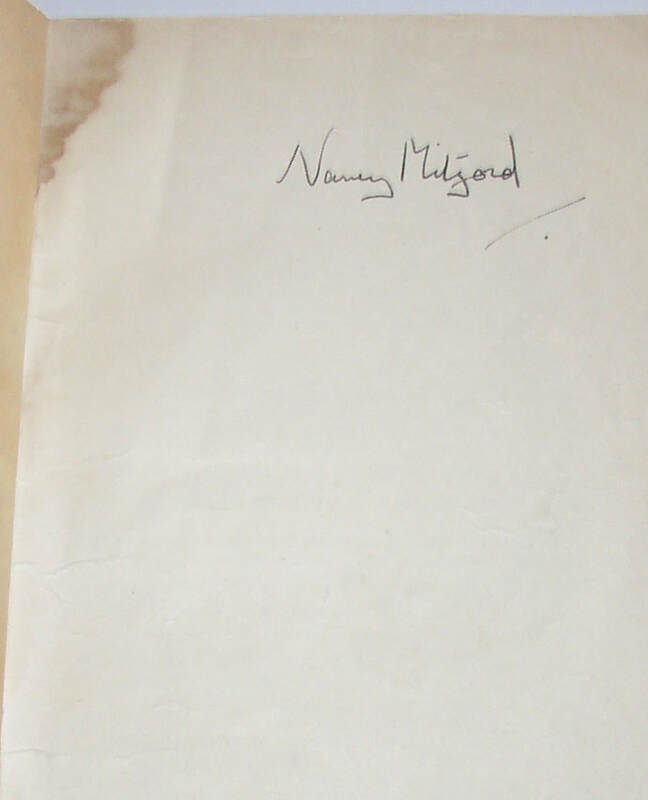 By way of courtesy, Ross seems to have sent this copy of the off-print to Mitford, with a brief inscription; Mitford, in turn, has signed it and written numerous marginal responses, often of disagreement. Mitford herself then wrote on the topic in a more popular, non-academic venue, and the whole topic achieved a startling iconicity in Britain in the later 1950s, becoming something that virtually every educated Briton was aware of and even talking about. This unique copy of an academic article, then, witnesses a surprising moment in which a scholar and a novelist had a powerful, even transformative, impact on their own contemporary popular culture. Also a key witness to growing recognition of the role of language in class consciousness and class behavior in post-War Britain. All in all, a central artifact of an important cultural discourse of the time. Condition: well used; Good or Good-minus, but complete. Some staining. Now held in a clamshell box. ​103. 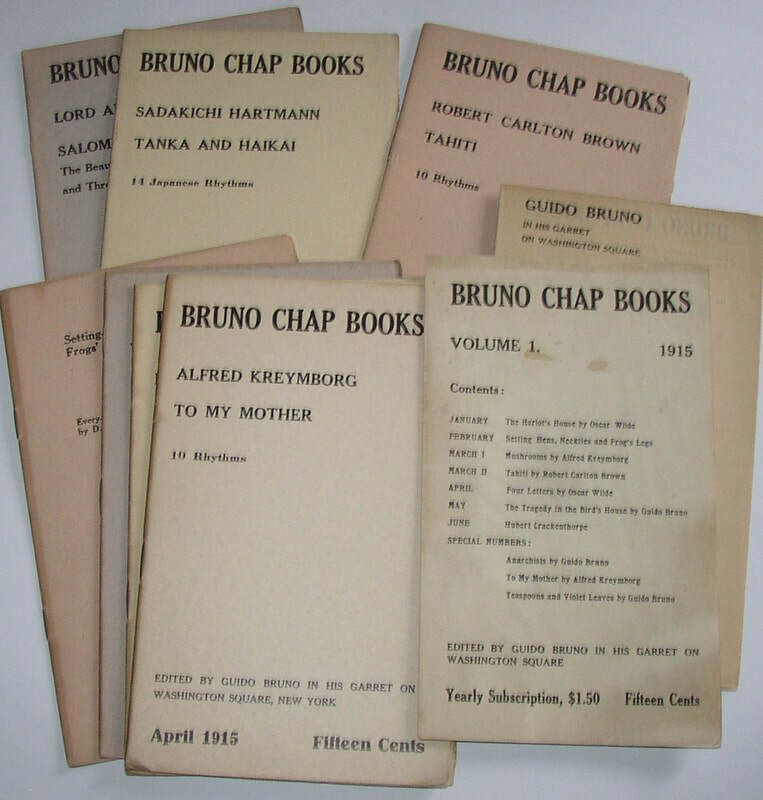 Seven (7) Guido Bruno Chapbooks (1915) plus 2 Ephemeral Bruno items. New York: Guido Bruno, 1915. Seven separate chapbooks (perhaps scarcer to find in this format than as bound volumes), from very early in the series. Notable scarcities in this set include Robert Carlton [later Bob] Brown, Tahiti, and Sadakichi Hartmann, Tanka and Haikai. The latter book is sometimes cited as including some of the very earliest Haiku poems written in English. Also included in a promotional flier for the series, listing only the first seven chapbooks plus three special numbers. A second flier advertises 19 chapbooks, which have gone up in price to 17 cents each. An early handful of items from this scarce series. ​104. Anaïs Nin, Solar Barque, signed first edition. 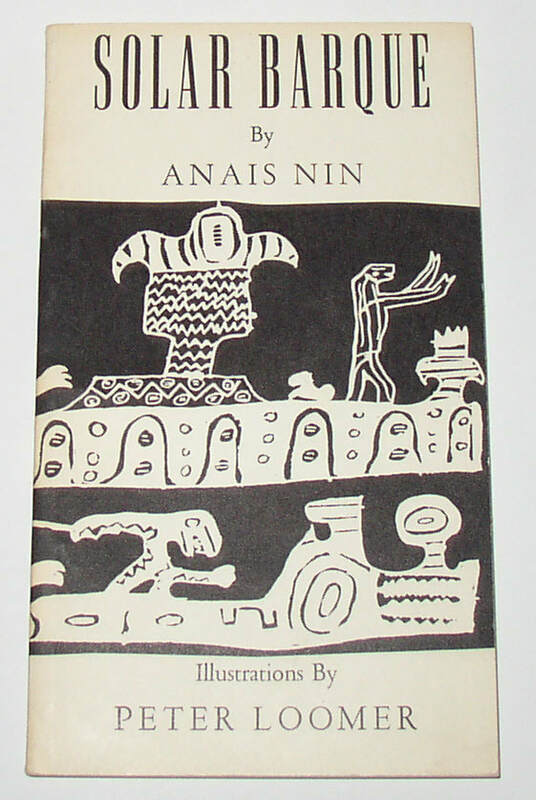 New York: Anaïs Nin Press, 1958. Paperback; signed and inscribed on front free end-paper by Nin. Condition: VG, with some mild browning to the spine and a bit of binder’s glue on the spine. ​105. 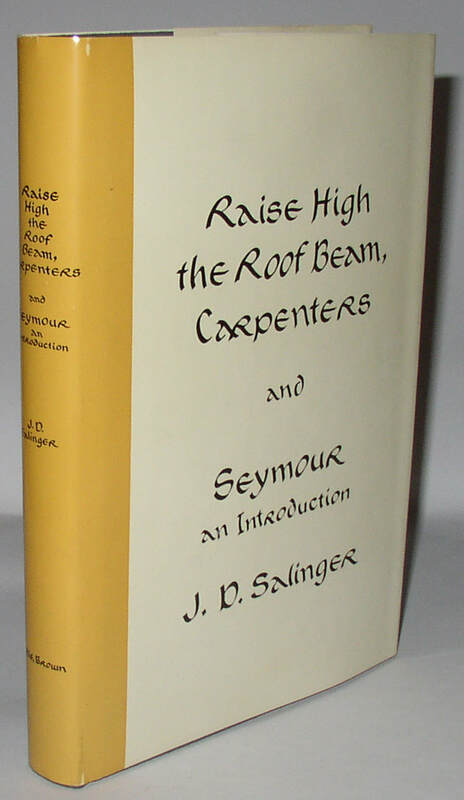 J. D. Salinger, Raise High the Roof Beam, Carpenters, US 1st ed, w/o dedication page. Boston: Little Brown, . First state of the first edition without dedication page present at all. Collector’s condition. Condition: books is about Fine; jacket has very mild surface wear: NF. A beautiful copy. ​106. 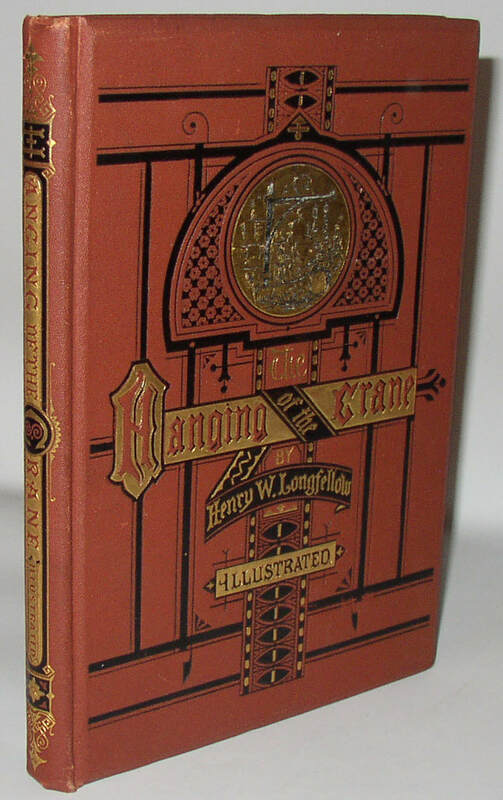 Henry Wadsworth Longfellow, The Hanging of the Crane, Inscribed 1st edition. Boston: James R. Osgood and Company, 1874. A beautiful copy of this book, in the publisher’s decorated binding, inscribed by Longfellow on the second end-paper in his calligraphic hand and dated November 23, 1874. BAL notes that the second printing occurred on Dec. 17, 1874, so this is obviously the first printing. BAL further notes that Longfellow inscribed copies for his daughters on November 20, 1874, so this presentation copy was prepared only three days later. A very early copy indeed. Condition: Close to Fine, with minor wear to the tips of the spine and the corners of the boards. A glue flaw at the top of the front free end-paper has resulted in a minor tear. ​107. 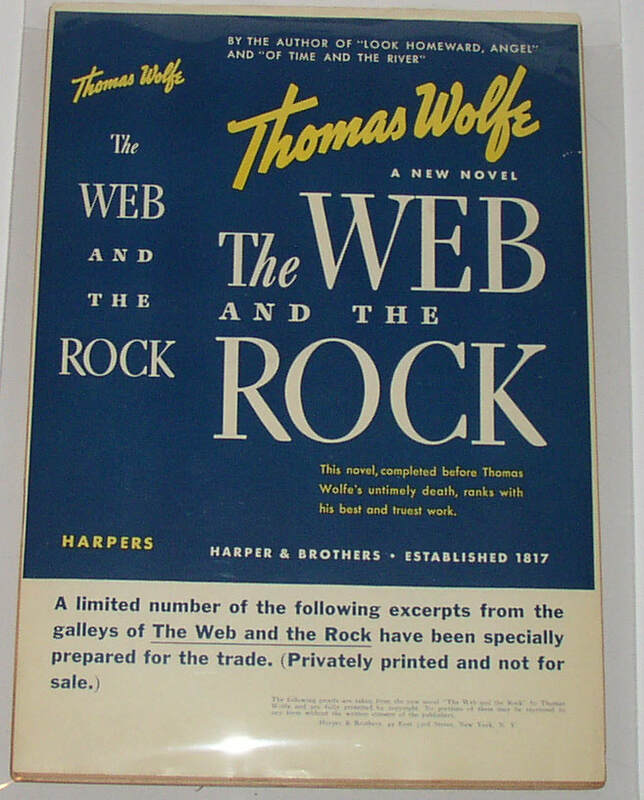 Thomas Wolfe, The Web and the Rock, advance excerpt printed from galleys (1939). New York: Harper & Brothers, 1939. Pre-publication excerpts from the novel prepared for the trade from the Galleys. Very scarce. Condition: low-quality paper used makes this item very fragile, with chipping at the page edges, especially at the rear. No rear cover present, probably as issued. Some incipient separation at the top of the last few leaves. Visually very appealing. ​108. Two great 1930s Children’s Books of Die-Cut paper models/toys. 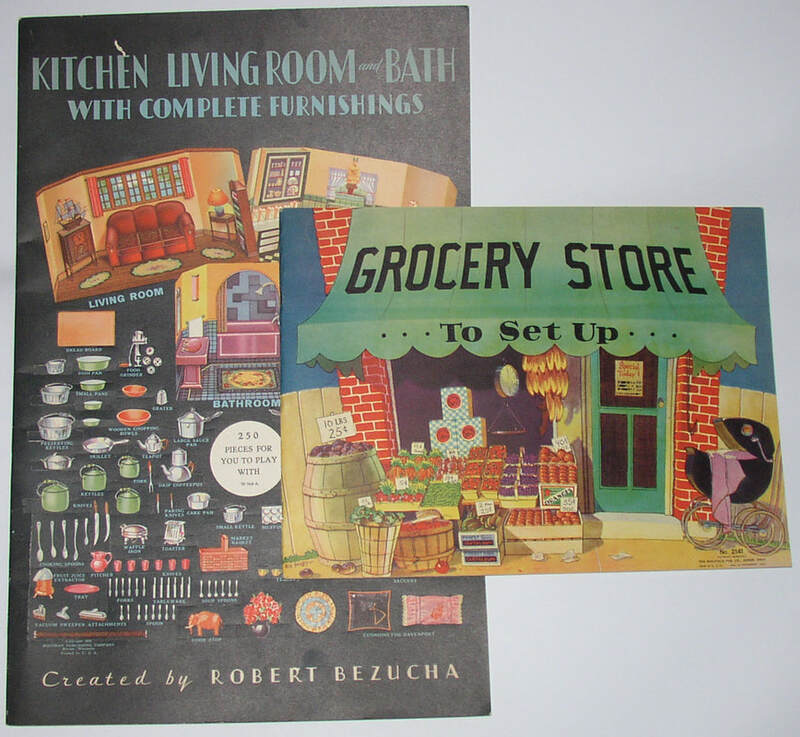 1) Fern Bisel Peat, Grocery Store to Set Up (Akron: Saalfield, 1937), and 2) Robert Bezucha, Kitchen, Living Room, and Bath (Racine, WI: Whitman, 1932). Both unused, with no pieces ever cut or popped out. The Bezucha book, in particular, is filled with great examples of 1930s Deco inspired décor. Condition: Children’s handkerchiefs inexplicably glued to inner boards of Grocery Store; one inch-long scrape near the “E” of Kitchen on the front of Kitchen; otherwise both books are Near Fine. ​109. W. D. Howells, Suburban Sketches, perhaps the earliest recorded signed copy (1870). New York: Hurd and Houghton, 1870. Signed and inscribed on the half-title by Howells, and dated there “Dec. 18, 1870.” BAL records the earliest example as Dec. 19, 1870, so this is certainly one of the earliest, if not the earliest, signed copy on record. Books signed by Howells from this early in his career are somewhat difficult to find. Condition: Externally, VG, with some of the signatures starting to loosen. ​110. 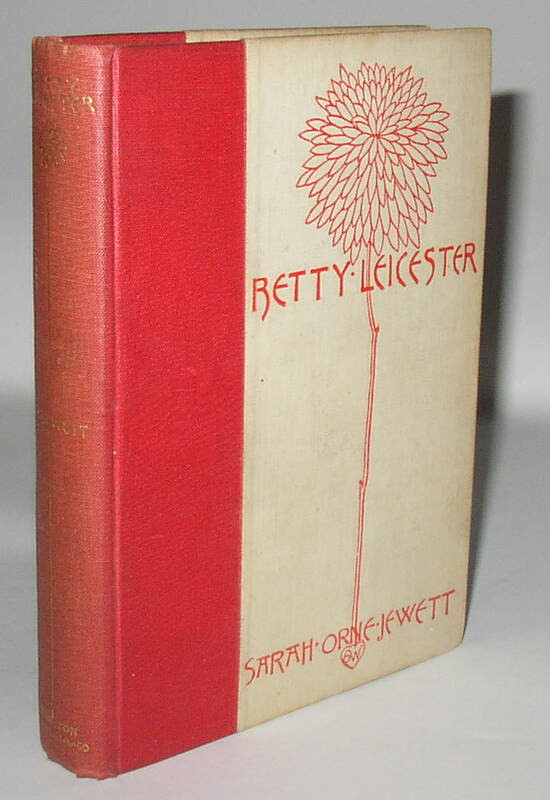 Sarah Orne Jewett, Betty Leicester, signed 1st edition (1890). Boston: Houghton Mifflin and Company, 1890. Signed and inscribed on the front free end-paper by the author: “For G. G. W/ with love from S. O. J./ Christmas 1889.” Signed before official publication in 1890, then, this must be an especially early copy of this book, signed by the author with her initials, as noted. Condition: VG, with mild lightening to the red cloth spine, and mild bumps at corners. Book plate on same end-page as inscription. ​111. 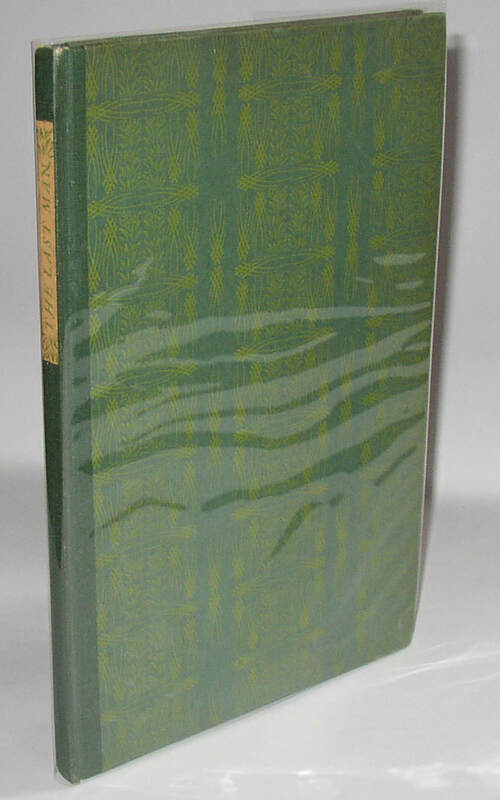 Sarah Orne Jewett, Betty Leicester’s English Xmas, 1st ed. In dj, 1894. Privately Printed for the Bryn Mawr Scool, Baltimore, Xmas 1894. White cloth binding, printed in gold. 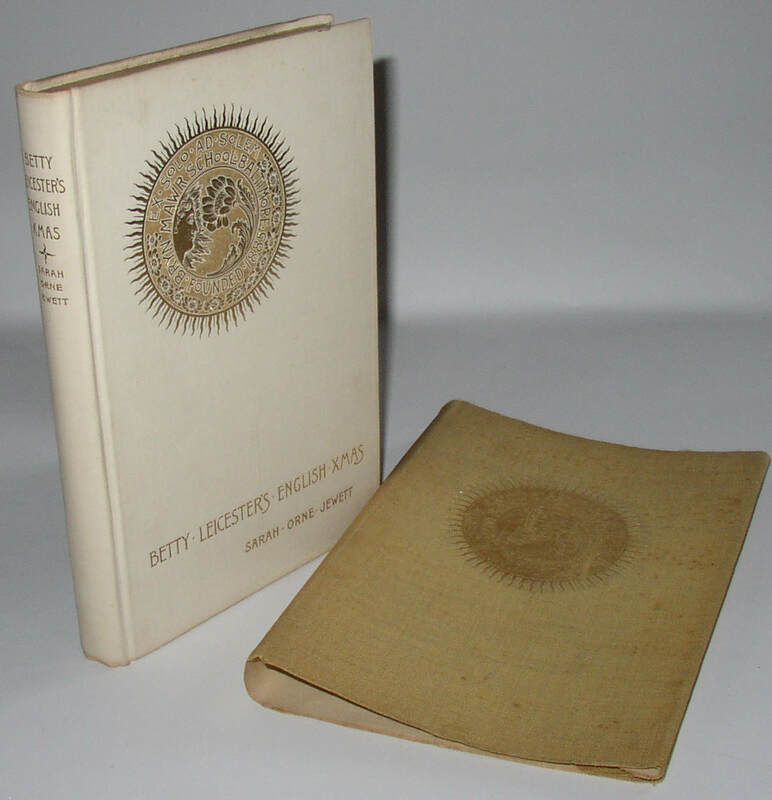 Original linen dust jacket has the same gold Bryn Mawr seal upon its front panel as appears on the board of the book; laid in is a program for the school’s Christmas Party in Dec. 1894. Surely a gift to a student at that time! A scarce book, and surely scarcer in jacket. Condition: pages of book and exterior of jacket both showing some foxing; otherwise remarkably bright. ​112. 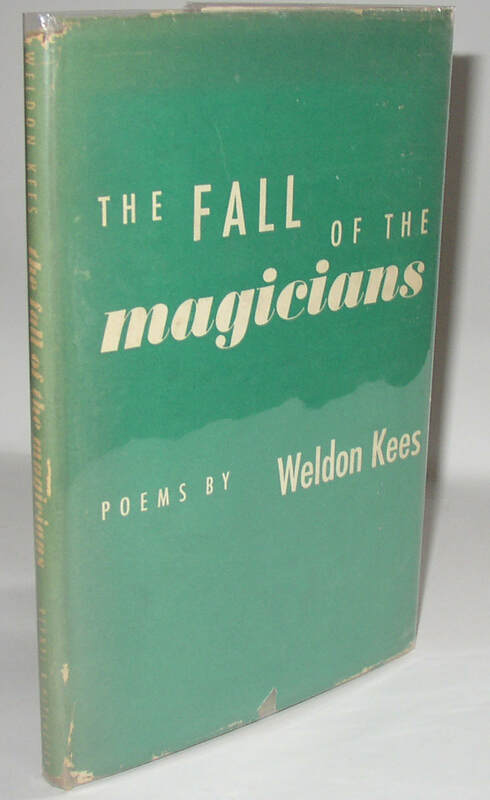 Weldon Kees, The Fall of the Magicians, signed 1st edition in dj. New York: Reynal & Hitchcock, 1947.Kees’s scarce second book, here in dust jacket, and with and inscription from Kees reading “To Jurgen--/ This book, to commemorate/ a book we wrote together./ Best/ Weldon/ San Francisco/ 1954.” Thus Jurgen Ruesch’s copy, Kees’s co-author on a book on Non-Verbal Communication. A key copy belonging to a figure closely associated with the poet. Condition: Book VG, with a bump to one corner; jacket with chipping and some tape repair to the reverse. ​113. 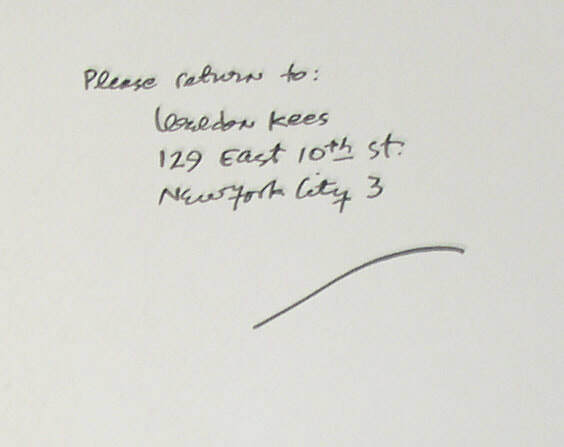 Weldon Kees, The Last Man, 1st edition: Kees’s own copy with his signature and New York address. San Francisco, Colt Press,1943. A very clean and attractive copy, with the author’s name and address on the front free end-paper: “Please return to:/ Weldon Kees/ 129 East 10th St.’ New York City 3.” One of the finest copies one could hope for. Condition: About Fine, with very light wear to the ends of the spine. ​114. Bob Brown, ed, Readies for Bob Brown’s Machine (1931). Roving Eye Press, 1931. A very scarce anthology or collection, printed in France, with contributions (often brief) from the likes of Ezra Pound, William Carlos Williams, Kay Boyle, James T Farrell, Gertrude Stein, et al. Condition: Good, with chipping and splitting to paper at spine ends, droplet spotting and discoloration on front wrap. ​115. 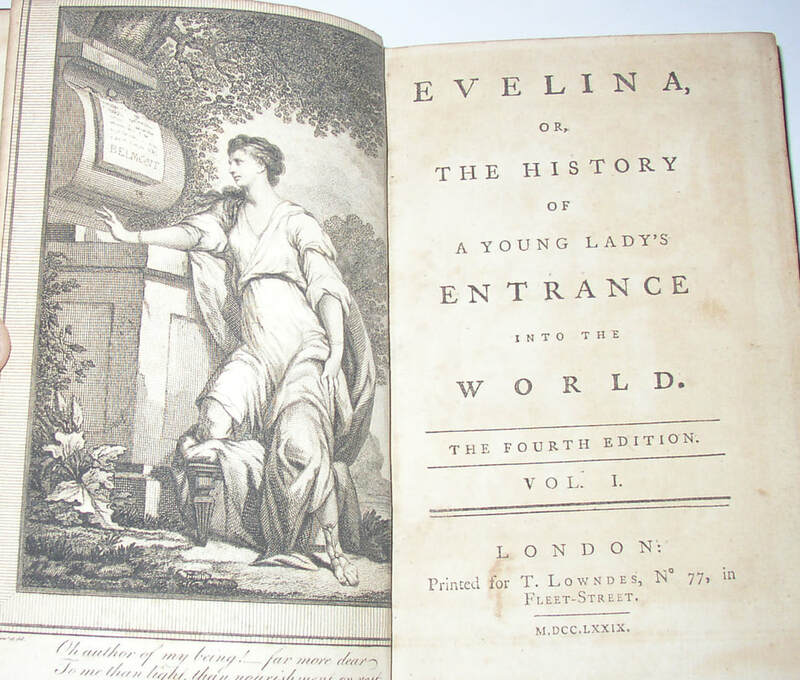 [Fanny Burney] Evelina, Fourth Edition, 1779. Three volumes. London: Lowndes, 1779. 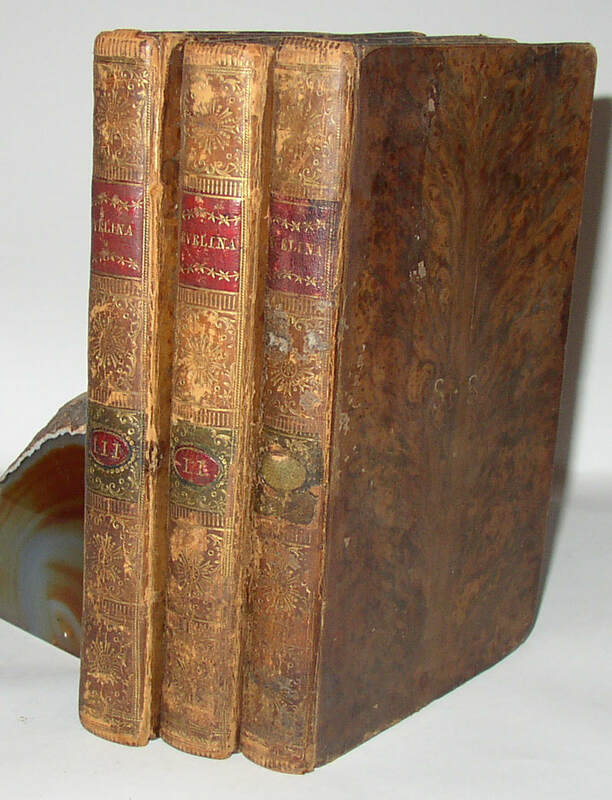 Classic eighteenth-century novel, in matched tree-calf leather bindings. Condition: Good condition, overall. Original calf leather bindings showing wear, but still holding well. One oval leather label identifying volume 1 as “I” has been lost. ​116. Walt Whitman, Leaves of Grass, Stated Third Edition, 1882. Boston: James R. Osgood and Company, 1881-1882. Third Edition stated on title page, but probably more precisely identified as a later edition than that—I think this corresponds to what is usually described as the third state of the seventh edition. Regardless, this is a remarkably well preserved copy of Whitman’s great book. Condition: Near VG in mustard cloth with bumping at spine ends. Minor exterior grubbiness and bumps, but no interior markings. ​117. 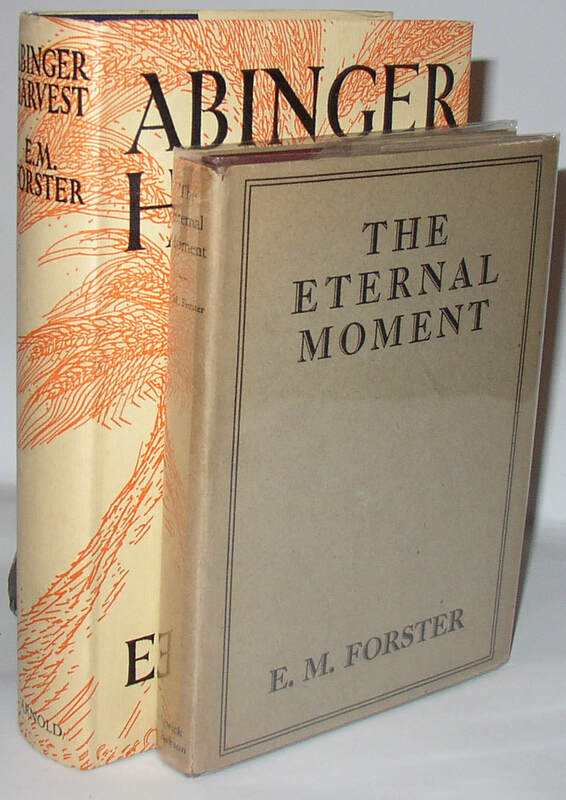 E. M. Forster, The Eternal Moment (1928) and Abinger Harvest (1936), 1st eds. in dj. Eternal Moment (London: Sidgwick and Jackson, 1928). First state in red cloth printed in gold. Abinger Harvest (London: Edward Arnold, 1936). First edition, with “A Flood in the Office” present, as required for the first. Scarce early Forster titles, even scarcer in dust jacket. Condition: Moment Near Fine in a very attractive jacket; the jacket is showing some splitting at the joints, though it is still holding together. Harvest about Fine/Fine, with some darkening inside at the endpapers, in part due to a publisher’s card laid in. ​118. 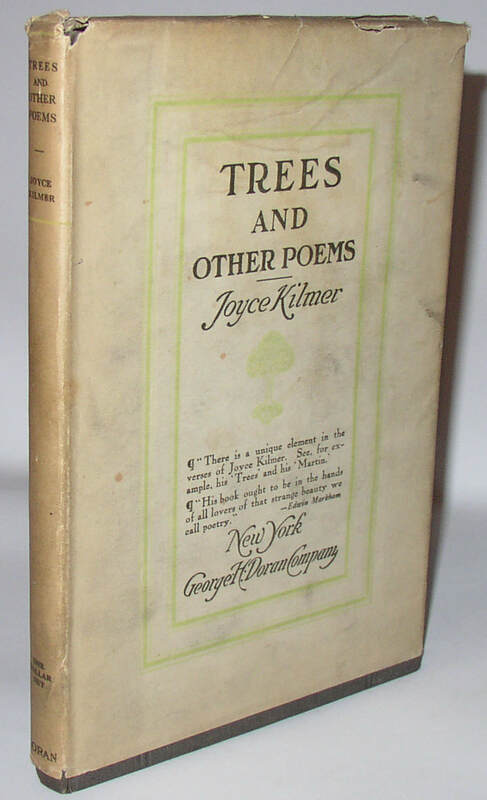 Joyce Kilmer, Trees and Other Poems, 1st ed, 1st state in dj. New York: George H. Doran, 1914. First state with grey paper-covered boards, no statement of “Printed in the United States of America” and with gilt on the top page edges. Dust jacket priced “one dollar” on the spine. Condition: Good/Good. Boards a bit spotted, spine label chipped at edges; bookplate inside. Jacket with staining and wrinkles and some chipping and loss at the top edge. ​119. 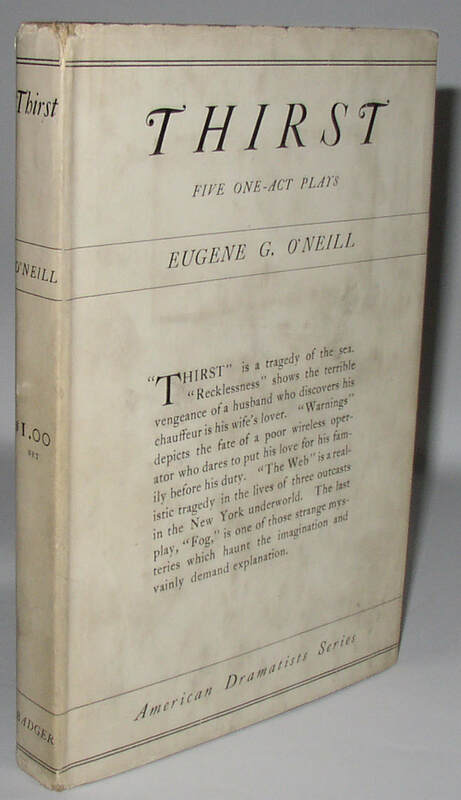 Eugene G. O’Neill, Thirst and Other One Act Plays, author’s 1st book, First ed. In dj. Boston: Gorham Press, 1914. A beautiful copy of O’Neill’s scarce first book, printed in an edition of 1000 copies only, in the very scarce original dust jacket. Condition: Book is NF, with a small label from the Gotham book Mart at the rear board. Jacket is Good, with grubbiness, some tattering to top edge, and two closed tears (about 1” each or so) on rear panel of jacket. Now housed in a slipcase and folding chemise. ​120. 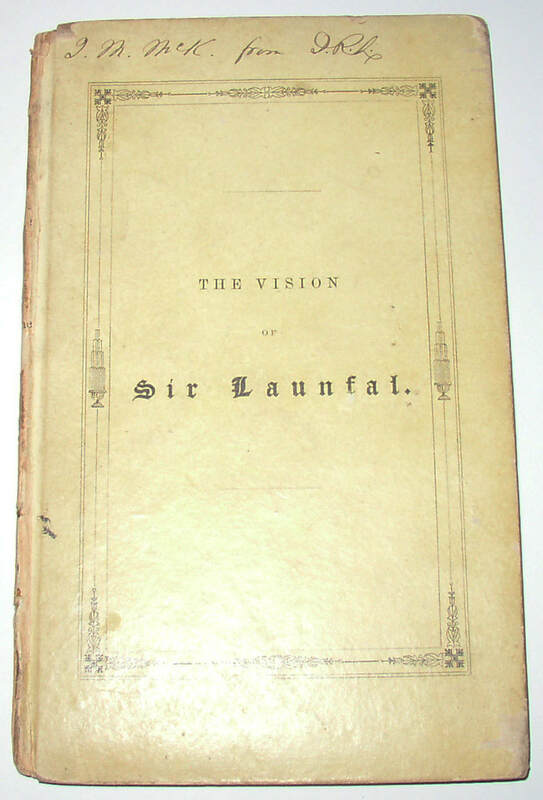 James Russell Lowell, The Vision of Sir Launfal, 1st ed. Presentation copy. Cambridge: George Nichols, 1848. 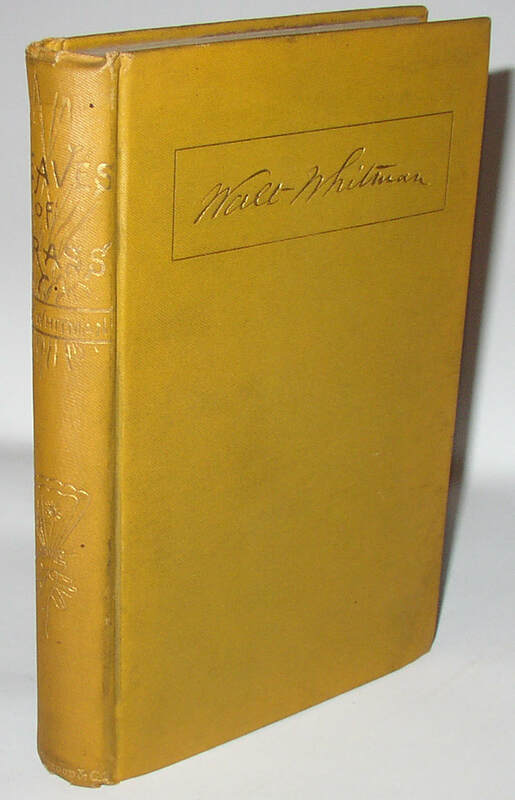 First edition in glossy yellow paper boards, with Lowell’s inscription on the top of the front board: “I.M. McK from J. R. L.” Scarce in a presentation copy. Condition: much of the paper from the spine now lacking, with the ends of the spine notably worn. Some wear and splitting at the various corners of the boards, as well. Good overall. Now in slipcase and folding chemise. ​121. 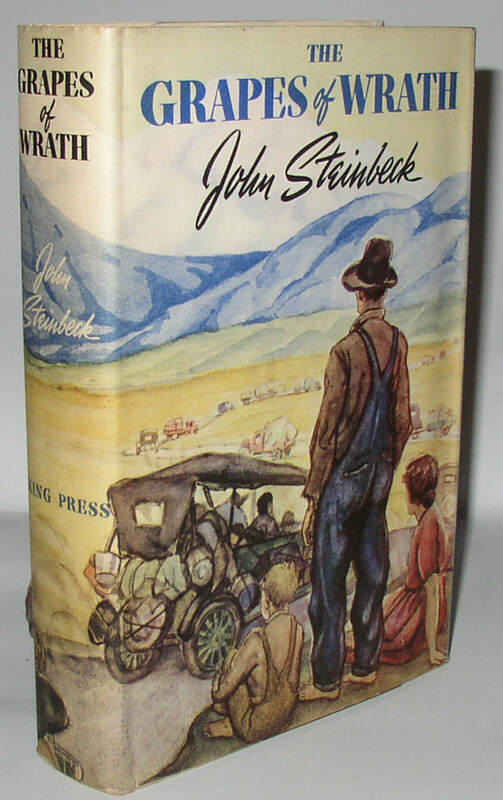 John Steinbeck, The Grapes of Wrath, 1st edition in brilliant original dj. New York: Viking, 1939. No indication of later printing in book; dj with “First Edition” text on front flap, as required. Overall, this copy is close to Fine/Fine, but with a couple minor flaws, some deriving from the fact that the jacket was once held in plastic. Still a beautiful copy. Condition: Book Near Fine, with very minor spots of stain on the paste-downs from contact with old yellowed tape: the tape was never affixed to the boards, just close to them. Jacket shows some similar areas of darkening from tape, but just shadows visible on the reverse. There is a wrinkle and a ¾” closed tear on the front panel; also some waviness to the front panel, but from storage and not from moisture. Also a ¼” closed tear at the top joint between front panel and spine. Still, without very close examination, this book looks almost new. ​122. 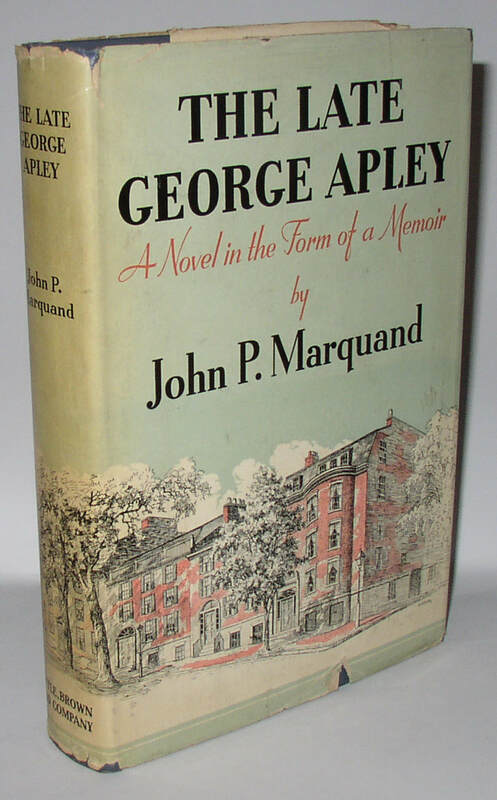 John P. Marquand, The Late George Apley, Signed and inscribed 1st ed. in dj. Boston: Little Brown, 1937. Pulitzer Prize winner in 1938, quite difficult to find in the dust jacket today. This copy with tanning to many of the pages from the paper stock used or press oil used, as usual. Lovely Pearl on p. 19, line 1. 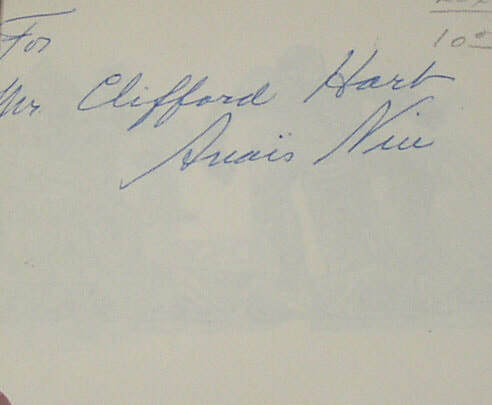 This copy signed and inscribed by Marquand on the first free end-paper. Scarce in dust jacket, and very collectible when signed. Condition: Book VG, with tanning as noted. Jacket with some wear and chipping around the edges. $2.50 price present. ​123. Robert Frost, A Boy’s Will, Signed later issue of the London 1st edition. 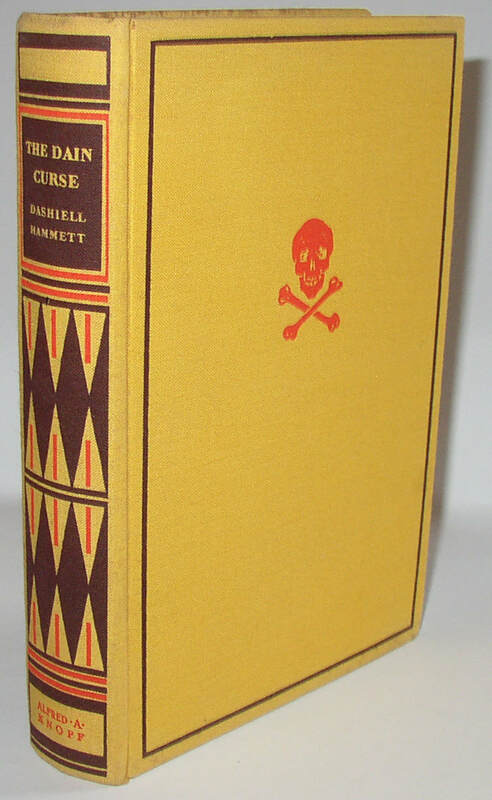 London: David Nutt, 1913, but one of 135 copies signed by Frost and numbered, with a “Printed in Great Britain” stamp applied to the verso of the title page, and apparently marketed in this country in 1923. Binding “D” with cream paper wrapped printed in black with four-petal flowers. Number 27 of the signed numbered batch. Very attractive. Condition: Near Fine, perhaps, with some finger marks from handling on the wrappers. ​124. Lot of five 1930s Children’s books about films: Snow White, Gone with the Wind. Saalfield; Merrill; 1936-1939. 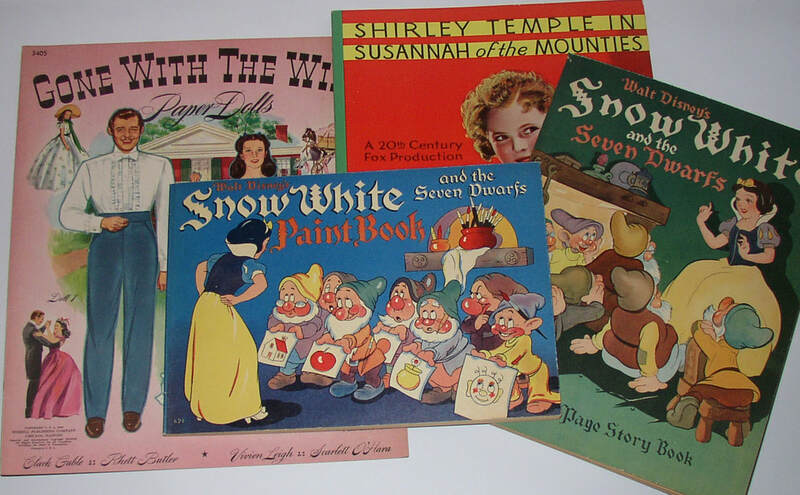 Two copies of Shirley Temple in “Susannah of the Mounties”; one copy each of Gone with the Wind Paper Dolls; Snow White and the Seven Dwarfs Paint Book; and Snow White and the Seven Dwarfs 96 Page Story Book. All are unused (even the coloring book) and in especially nice shape for cheap children’s books. Conditon: All in Near Fine condition; some minor chipping to a few page edges in the Snow White 96 Page Story Book, but seemingly more from manufacture than use. ​125. 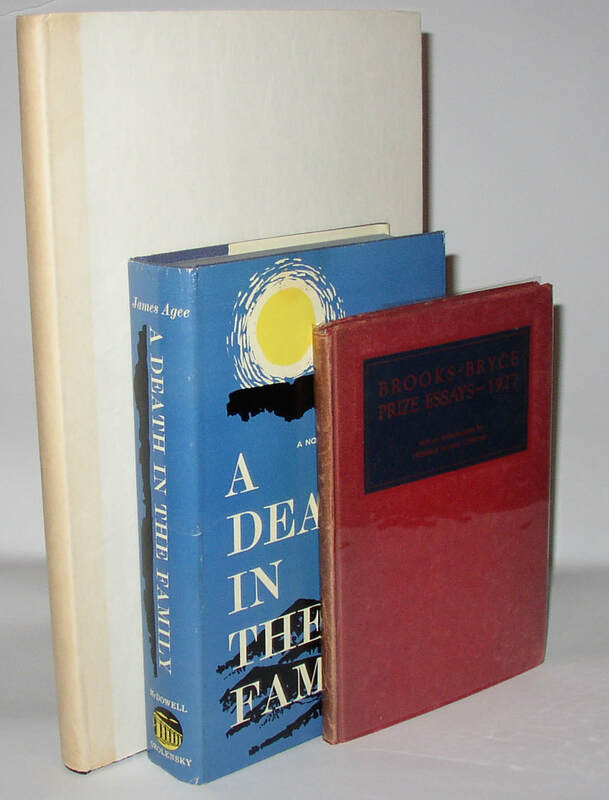 Three James Agee 1st editions: with A Death in the Family and Four Early Stories. A Death in the Family in the first state, with “Walking” in error for “Waking” on p. 80. Four Early Stories in beautiful condition. This lot also includes The Brooks-Bryce Anglo-American Prize Essays, 1927, in which Agee’s essay earned third prize, his first book publication. ​126. Hawker and Porter, Instructions to Young Sportsmen in . . . Guns and Shooting, 1st American ed, 1846. Philadelphia: Lea and Blanchard, 1846. First American edition of this classic of its genre, with various additional contributions suited towards American sportsmen in particular. Two contributions by H. H. Sibley; this copy with a signed letter by Sibley laid in, along with another letter (dated 1915) presenting the Sibley letter to a collector as suitable for including in this volume. 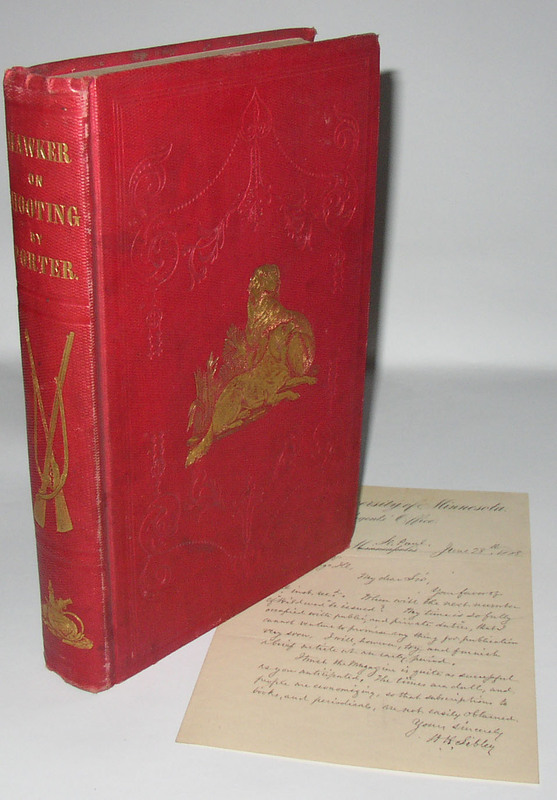 Condition: Original red cloth binding with gilt; bumping and wear at the tips; bookplate on interior of front boards; early owner’s signature on title page. Overall approaching VG. Now in a slipcase and stiff folding chemise for protection. ​127. 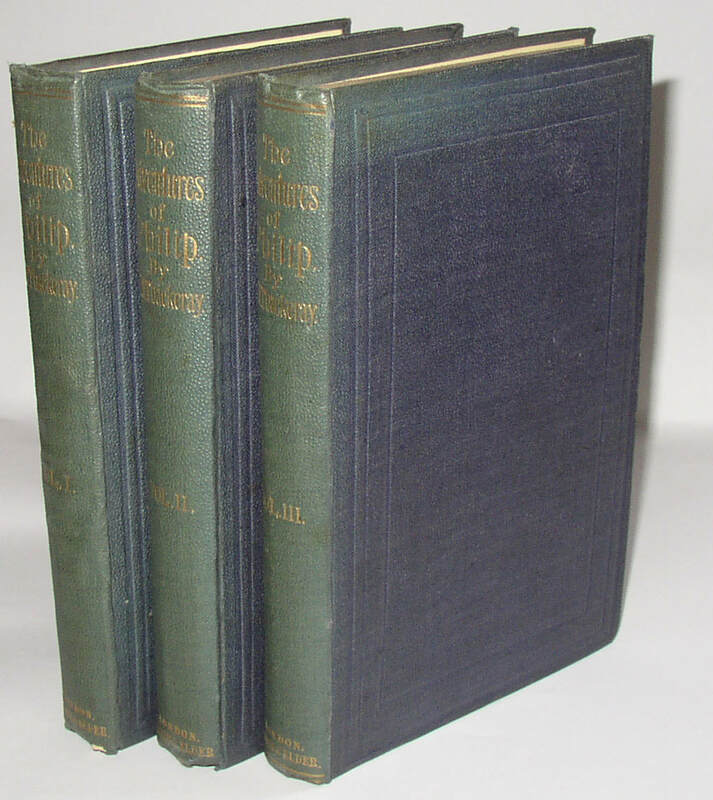 Three books in Decorative Publisher’s Bindings, 2 designed by Margaret Armstrong (1902). Lot includes: A) Joe Lincoln, Cape Cod Ballads, 1st edition (1902), Near Fine in Near Fine dust jacket. Illustrations by E. M. Kemble; matching designs (by Mira Burr Edson) on jacket and front boards. B) George W. Cable, Bylow Hill, 1st edition (1902) in original dust jacket; design on jacket unrelated to the Armstrong binding design. C). Elizabeth Barrett Browning, Sonnets from the Portuguese (1902). No dust jacket, but with Margaret Armstrong binding design and illustrations or decorations throughout. These early dust jackets are nice to find. Condition: Lincoln Book is NF/NF; Cable Book is VG/G (book has bookplate inside and owner’s name written in); Browning Book VG+. ​128. 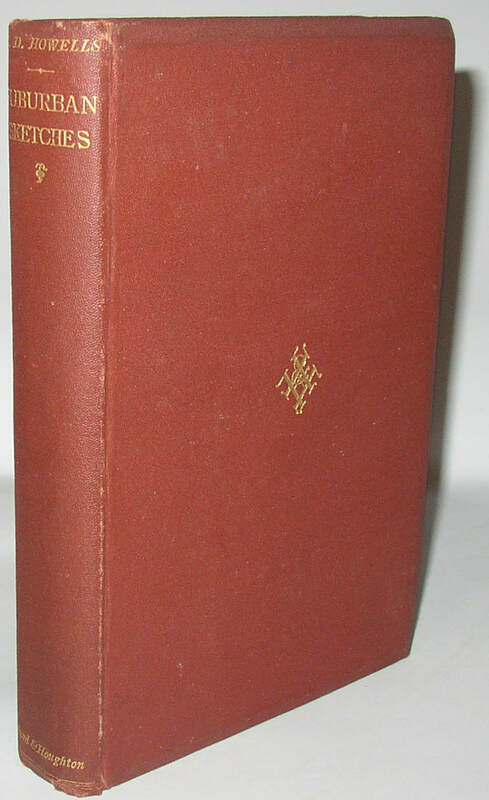 William Makepeace Thackeray, Adventures of Philip, 1st ed, apparent first issue binding. London: Smith, Elder, & Co, 1862. The bottom of each spine reads “London/ Smith & Elder” apparently marking the first binding to be used on this edition. Deep blue or purple pebbled cloth, with the spines now faded to a bluish color. Bookplates on the inside front boards. This lot also includes The History of Samuel Titmarsh and the Great Hoggarty Diamond. Second edition, in a fine example of the Bradbury & Evans decorated boards, but with the Smith, Elder, & Co. title page. Condition: Philip at least VG, one 1/8” square chip from the bottom of the spine of v. 1, and with spine fading and bookplates as noted; now housed in a folding slipcase, which is itself showing some wear. Hoggarty Diamond about VG+. ​129. 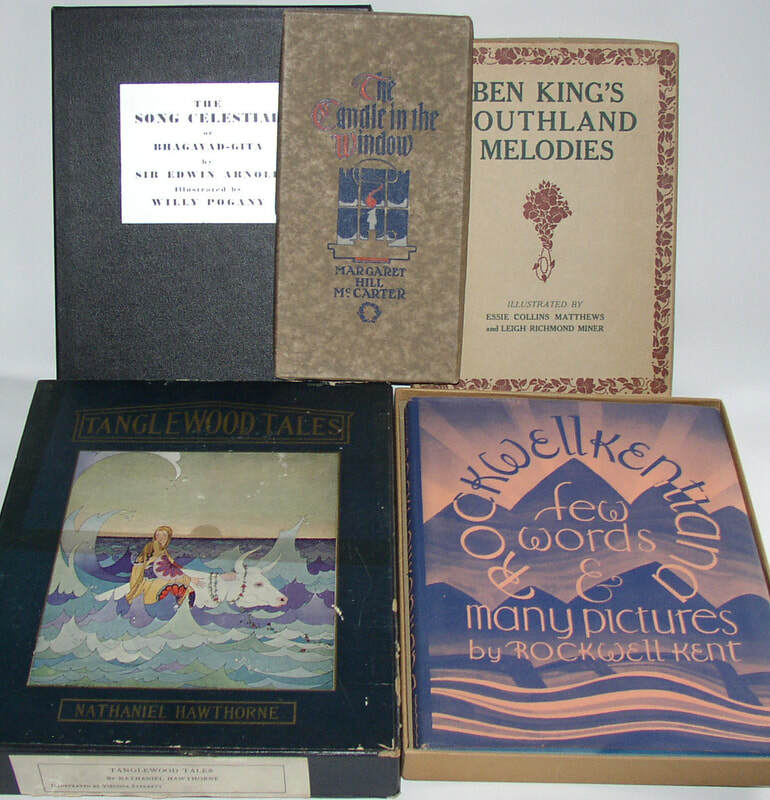 Five books in original publishers’ boxes, including Hawthorne’s Tanglewood Tales. Includes: 1) Margaret Hill McCarter, The Candle in the Window [Chicago: McClurg, 1925]. Box design matches cover design. 2) Ben King’s Southland Melodies [Chicago: Forbes & Co., 1911]; box design matches cover design, but in different colors. 3). Rockwellkentiana [New York: Harcourt Brace, 1933]; first edition in dj (jacket has some edge-wear); plain box with two split corners on the top. 4) Edwin Arnold, The Song Celestial, illus. by Willy Pogany [Philadelphia: David McKay, 1934] acetate dj with some tears; box with printed labels. 5) Nathaniel Hawthorne, Tanglewood Tales, illustrated by Virginia Sterrett. [Philadelphia: Penn Publishing, 1921. Glassine dust jacket lacking front panel and front flap. Box with some surface wear and one split corner on top. This book is especially beautiful. Condition: books, in general, very well protected by these boxes; see additional comments above. ​130. Babette Deutsch, Epistle to Prometheus, 1 of 10 copies, limited author’s edition, signed. New York: Jonathan Cape and Harrison Smith. Red leather binding. Limitation statement reads “Of this book ten copies were specially printed for the author on Dutch Charcoal paper: this is one of them” Signed and inscribed on the second end-paper “For dearest Mamma,/ with devoted love./ Babette/ 9 III 1931.” Author’s presentation copy, obviously, in special binding and on special paper; very limited. Condtion: leather darkening at spine and edges, some surface abrasion/loss to leather. VG. Contact Editions . One of 400 copies intended to be issued in this format, but apparently, only some smaller number of copies was actually issued. This copy is largely unopened and unread; as early as page 33, the leaves are unopened. A scarce book in this format. Condition: wrappers showing some wear and toning. About VG or a bit better. Now held in a slipcase and stiff folding chemise. ​132. 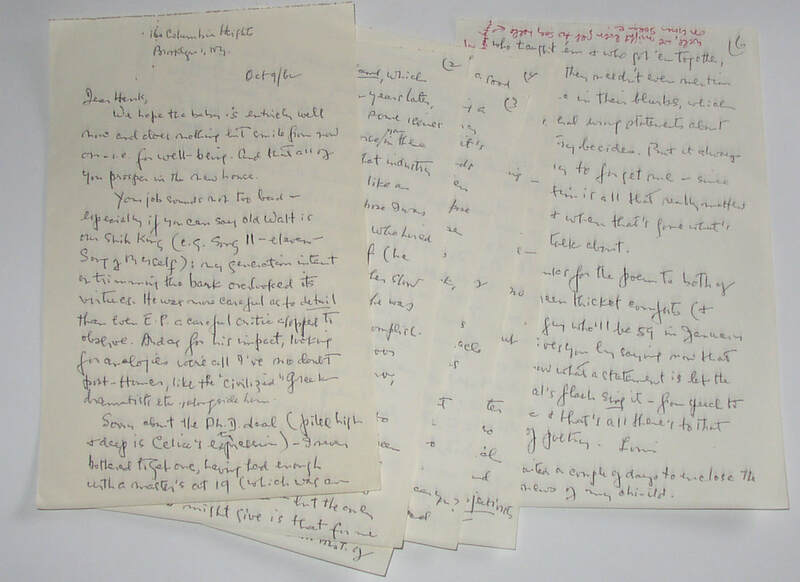 Lengthy six-page manuscript letter from Louis Zukofsky to a younger poet. Dated October 9, 1962, and addressed only to “Hank,” Zukofsky ranges over a lot of territory, in part apparently responding to his correspondent’s having landed a teaching job, and encouraging him to go ahead and get the PhD, if he can. Some discussion of the history of the Objectivists, some discussion of publications, invitations, and Zukofsky’s own complex history with university teaching. All in all, a fine and interesting letter, with nothing perfunctory about it. Condition: no mailing envelope; some bends, and a rust mark from an old paper clip. ​133. 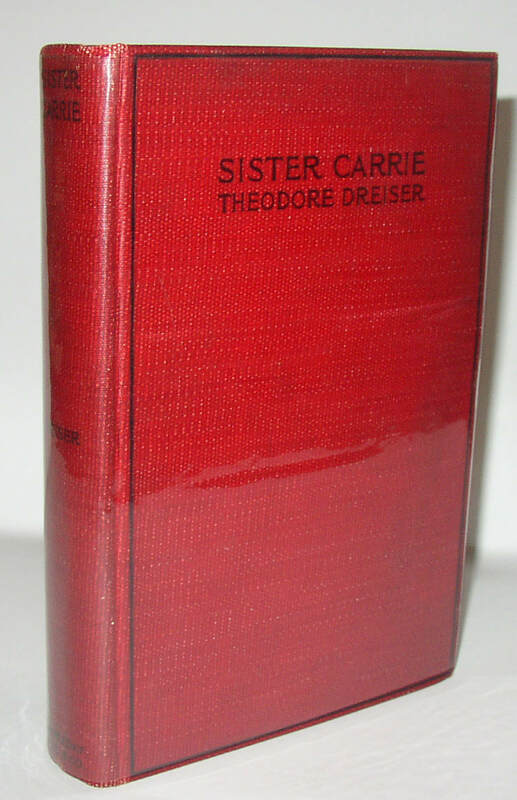 Theodore Dreiser, Sister Carrie, rare US 1st edition (1900). New York: Doubleday, Page & Co., 1900. Dreiser’s first book, and one of his most important books: indeed, a central American novel. Very scarce in the first edition, because the content was considered controversial. This copy in exceptional condition. Condition: Mild wear and bumps to the exterior tips: the red cloth has held its color very well. Some mild internal foxing. At least Very Good, and probably closer to Near Fine. Truly a beautiful copy of a scarce book. ​134. 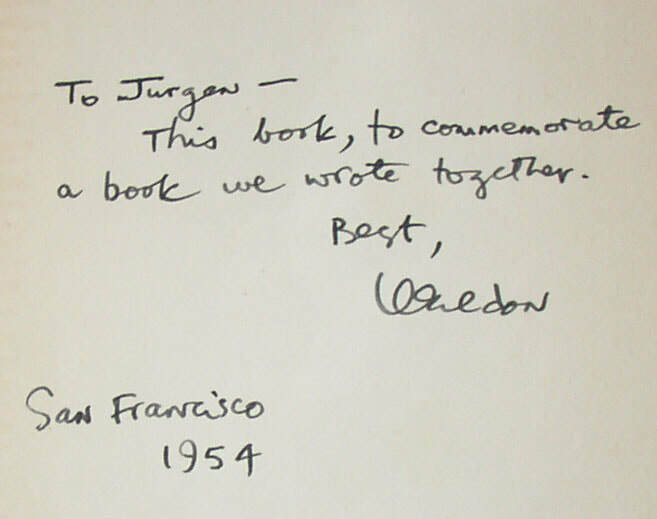 Robinson Jeffers, signed & inscribed 1st ed. 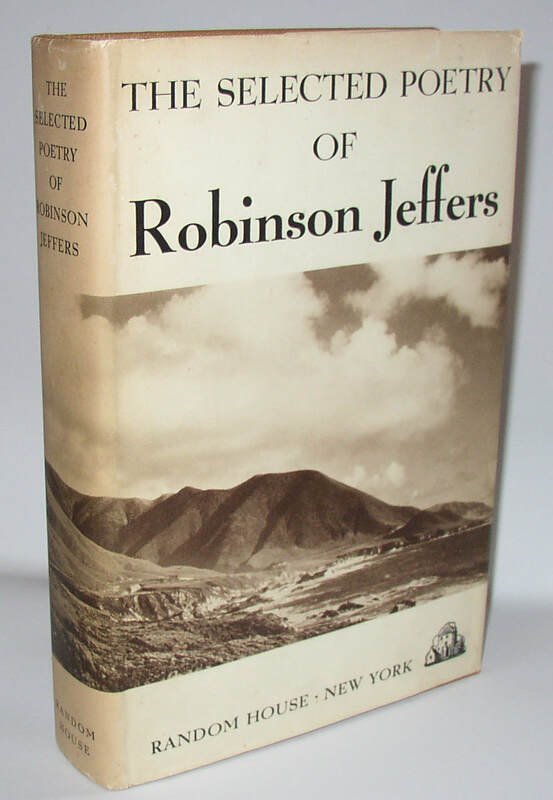 Selected Poetry of Robinson Jeffers. New York: Random House, 1938. Signed by Jeffers, with a brief inscription indicating that the inscription was written at Tor House, Jeffers’s home in Carmel, CA, in October 1939. Condition: Book and Jacket in NF condition, but for some browning to the front endpapers from some old newspaper clippings. The clippings (and a photo of Jeffers at Tor House) now in an envelope, but still accompanying the book. Mild darkening to spine of jacket, and some wear to jacket edges. New York: George H. Doran, 1922. 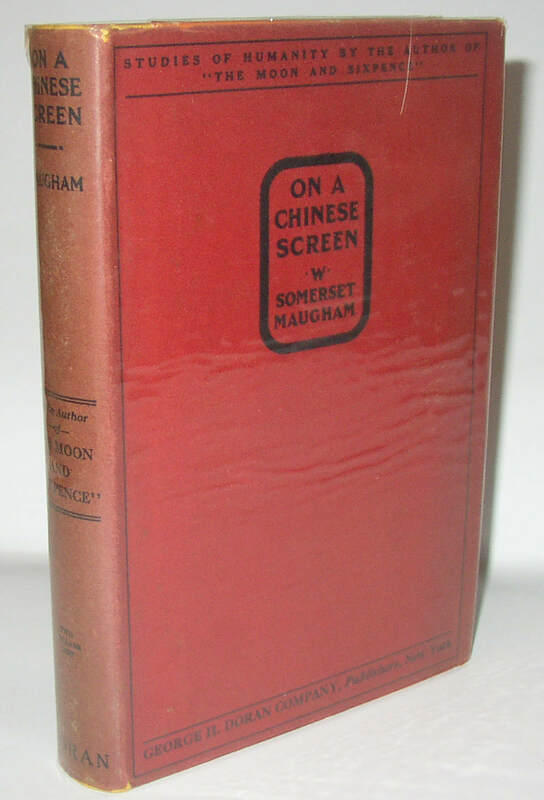 Scarce early Maugham book in original dust jacket. Condition: Wear to the bottom of the boards, affecting the bright orange color of the paper; one bumped corner with a split to the paper. Dust Jacket is close to Fine, with some mild fading to the spine. Just the tiniest corner chips to the jacket’s spine ends. ​136. 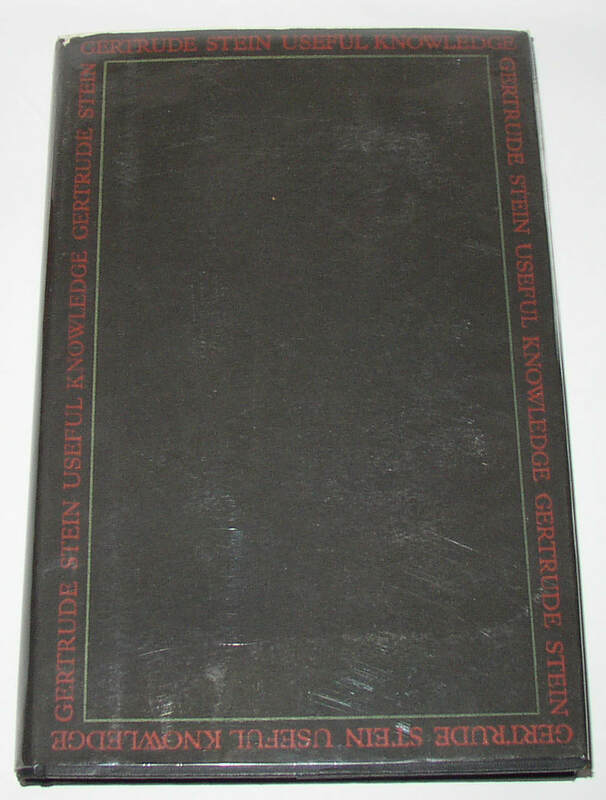 Gertrude Stein, Useful Knowledge, UK 1st ed. In dj. London: John Lane/The Bodley Head, . 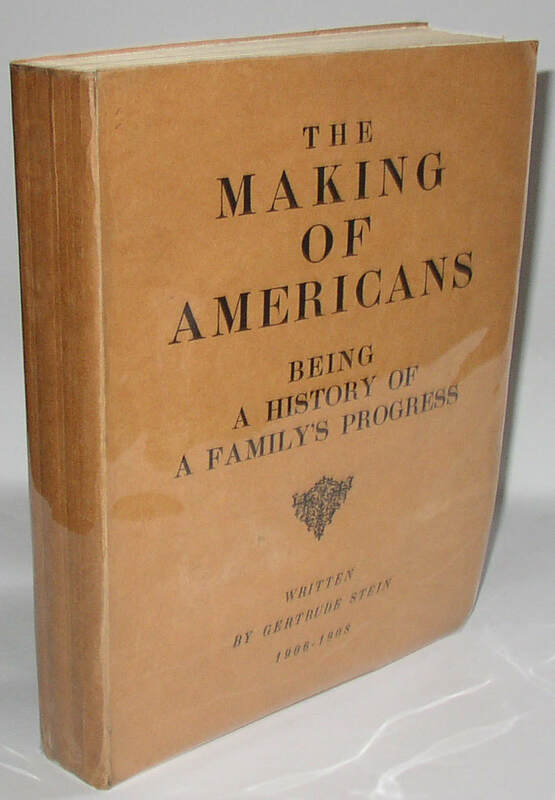 Stein’s discussions of various American figures; first English edition in dust jacket. Condition: Book with minor wear to the tips and discoloration/foxing related to the presence of the jacket. Some pages roughly or clumsily opened up until p. 18; afterwards, entirely unopened, I think. Jacket is complete, with some very minor loss at the top front corner of the spine. ​137. 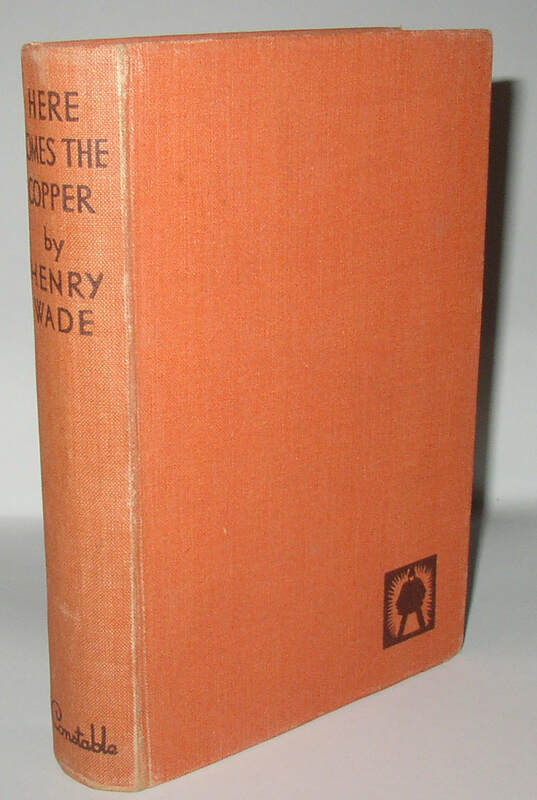 Henry Wade, Here Comes the Copper, first edition, with an Ellery Queen inscription. London: Constable, 1938. Scarce and collectible mystery novel from Henry Wade. 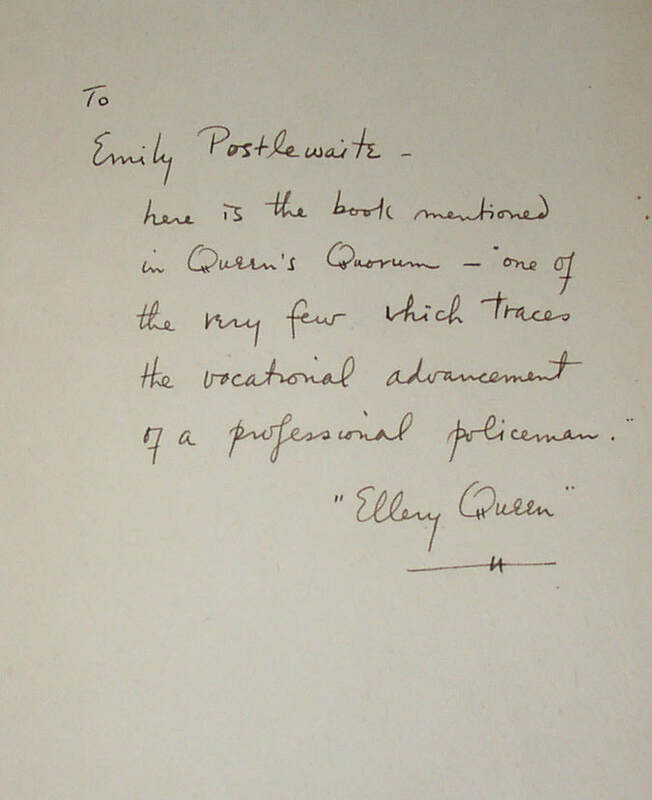 This particular example made even more interesting by the presence of a lengthy inscription from Ellery Queen: “To Emily Postlewaite—here is the book mentioned in Queen’s Quorum – ‘one of the very few which traces the vocational advancement of a professional policeman.’” The signature “Ellery Queen” is itself placed in quotation marks, an acknowledgment that the name was a pseudonym. But it appears that this inscription is an authentic one, and the hand appears to match that of Frederic Dannay, one of the Queen co-authors. A very interesting association. 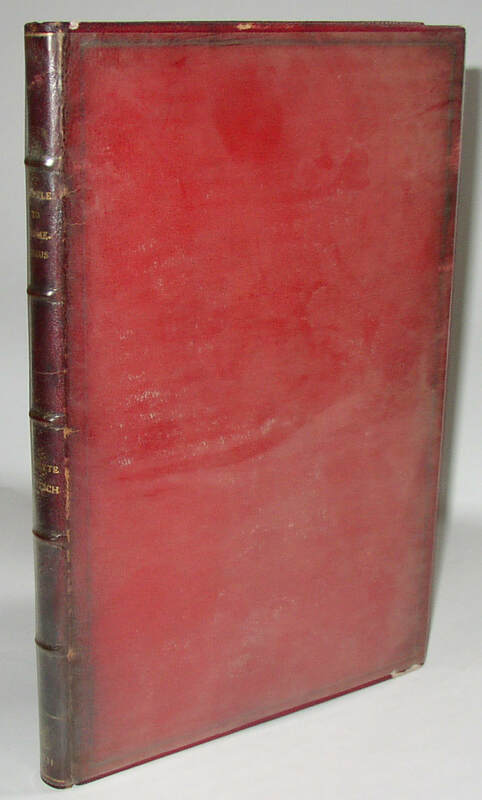 Condition: Near Very Good, with some external wear and mild spine roll; half-inch closed tear at bottom of title page. ​138. 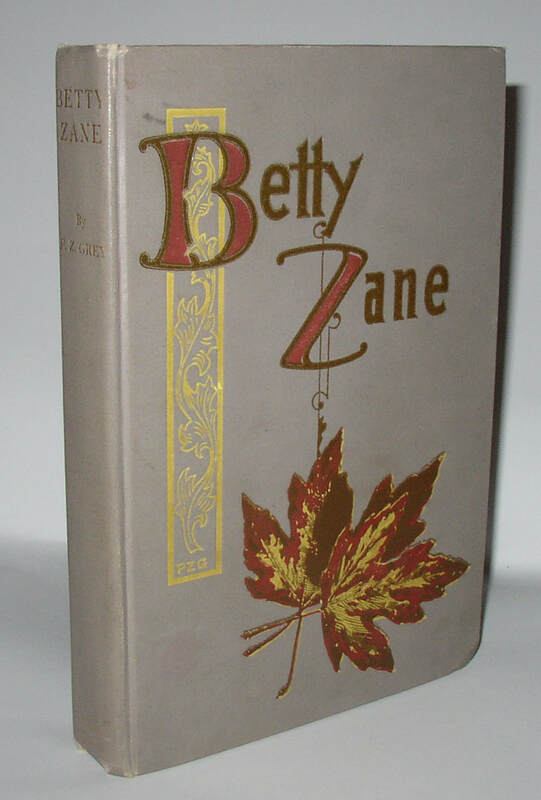 Zane Grey, Betty Zane, 1st ed. presentation copy, with a signed letter tipped in. New York: Charles Francis Press, 1903. First edition of Grey’s first book, a presentation copy with a very friendly (undated) two-page letter signed by Grey tipped in at the front board. 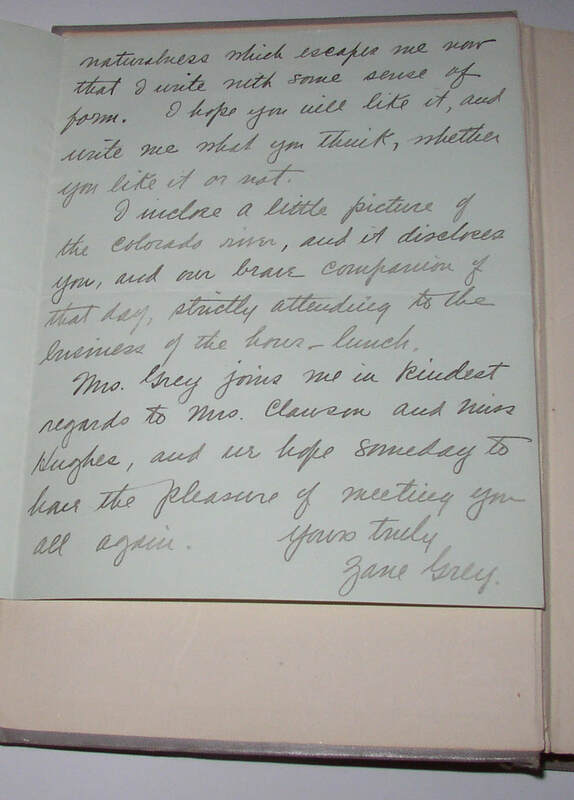 The letter reads, in part, “I am sending you a copy of ‘Betty Zane’, which I am sure you will enjoy more than anything of mine written at a later period. It has a naturalness which escapes me now that I write with some sense of form. I hope you will like it, and write me what you think, whether you like it or not.” A newspaper photo of Grey is tipped to the half-title, with some associated browning to the two pages. Condition: some bumping to the corners, and a bit of grubbiness to the back, but still a well-taken-care of copy, with no splitting at the hinges. Gauntlet Press. 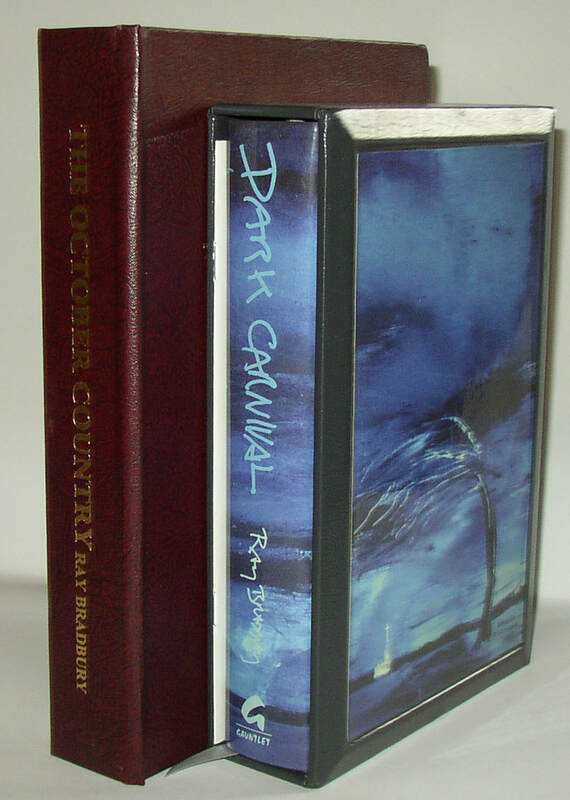 Dark Carnival (2001) is number 451 of an edition of 700, and it is signed by both Bradbury and by Clive Barker. Fine condition. The October Country, 40th Anniversary Edition (1997) is Letter N of a lettered edition of 52 copies, and is signed by Bradbury, by Dennis Etchison, and by Robert McCammon. Book is Fine, hard clamshell case with a book-length quarter-inch crumple at the hinge from storage. ​140. 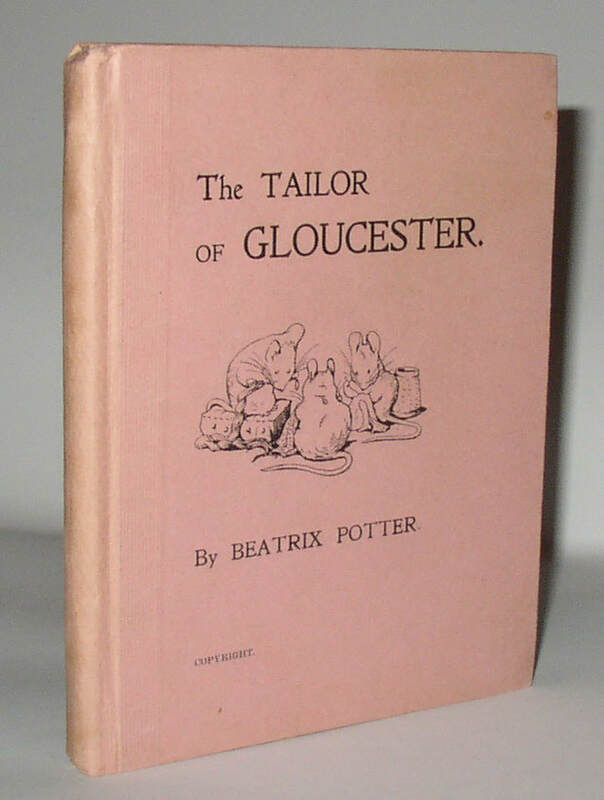 Beatrix Potter, The Tailor of Gloucester, rare privately published 1st ed. [privately printed], 1902. Pink paper-covered boards with line drawing of three mice on the front board. Privately printed for Potter before the runaway success of Peter Rabbit. 500 copies printed. This copy remains very attractive. Very collectible. 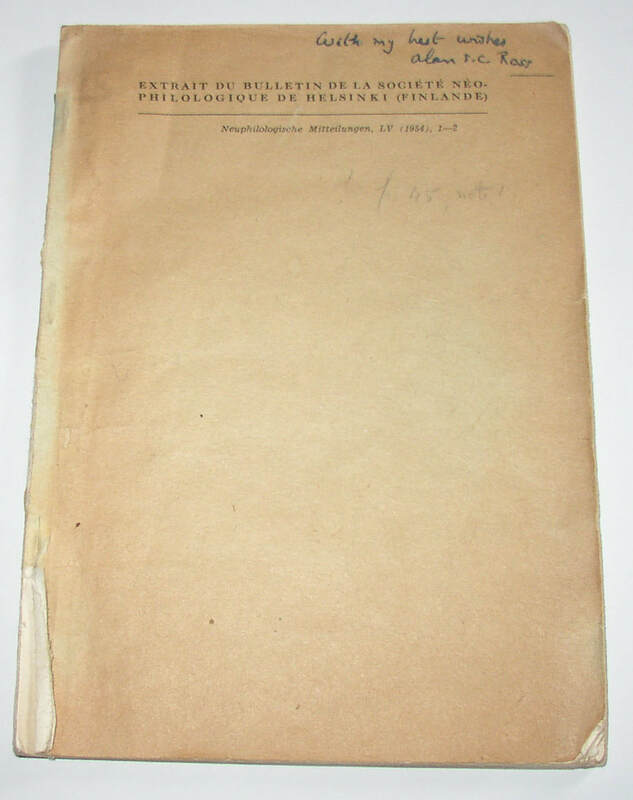 Condition: typical light toning to end-papers; bumping to spine ends. One small spot on front board and one bump/split to bottom of front board: each about 1/8” or smaller. Close to Near Fine, I think. ​141. Raymond Carver, What We Talk About When We Talk About Love: 8 1st ed. copies. New York: Knopf, 1981. New and unread copies, some still with original price stickers on front panel of jacket. Purchased new; one with original receipt laid in. 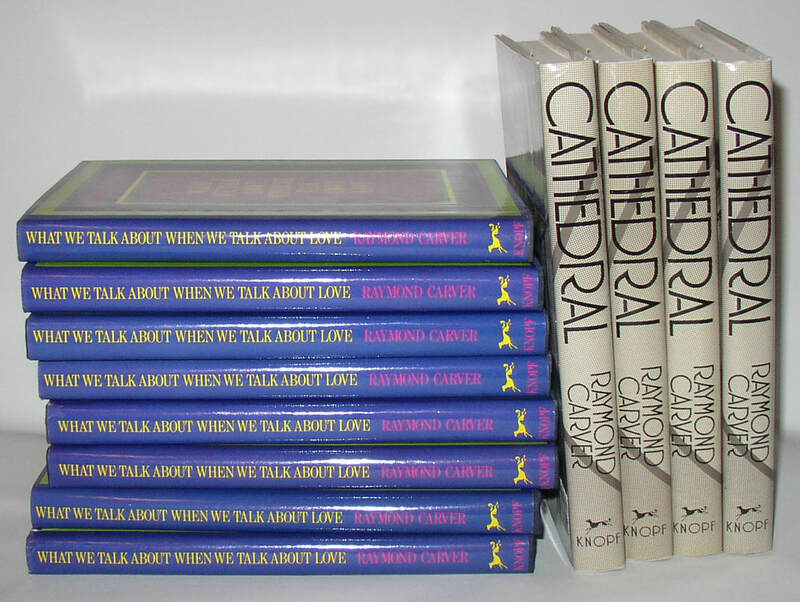 Accompanied by 4 first edition copies of Carver’s Cathedral (Knopf, 1983). Condition: About F/F, but one or two copies with minor flaws at the edges of the jackets. 142. 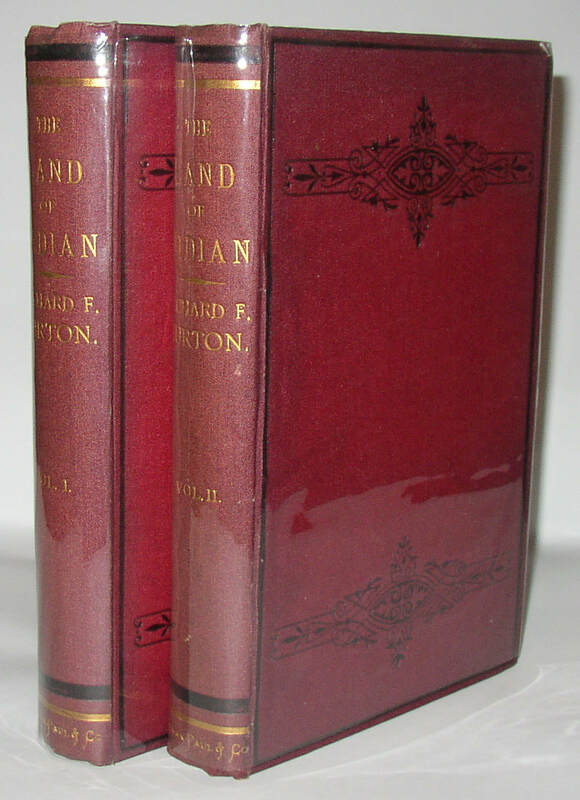 Richard F Burton, The Land of Midian (Revisited), 1st ed, 1879. London: C Kegan Paul, 1879. Two volumes. Nearly perfect copies of this important record of Burton’s travels. Maroon cloth; no ads present. Condition: Close to Fine, with mild darkening to edges of boards and spines, mild bumps/wear at spine ends. Excellent copies. ​143. 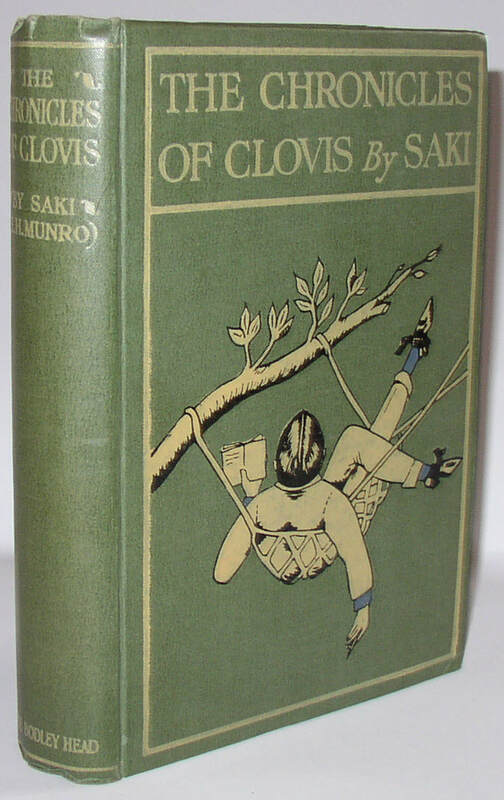 H H Munro (Saki), The Chronicles of Clovis, UK 1st ed. (1912). London: John Lane The Bodley Head, 1912. First edition of this book by Munro, one of the acclaimed masters of the short story. Clean, attractive copy. Condition: Bumping at spine ends, and at corners of boards. Mild dulling to cloth. VG. ​144. 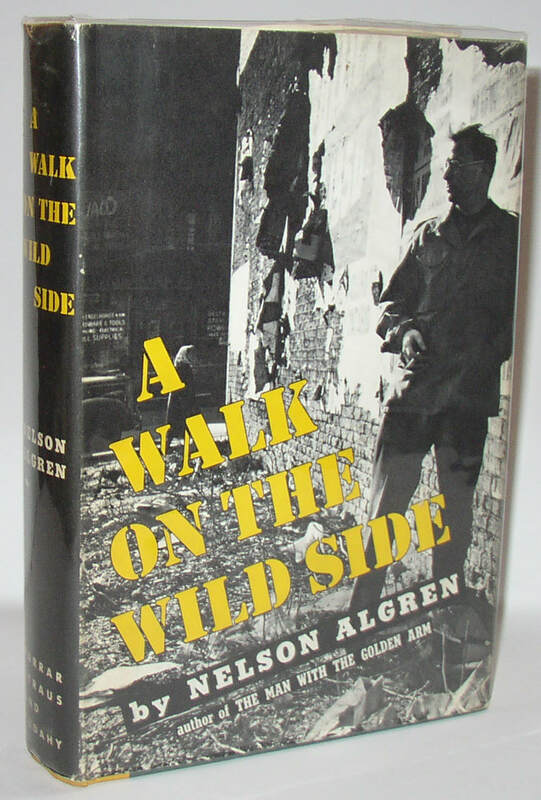 Nelson Algren, A Walk on the Wild Side, signed 1st ed. Presentation copy. New York: Farrar Straus and Cudahy, 1956. No top stain. First printing stated, with a long inscription by Algren, dated May 21, 1956, crediting the addressee (“Vaw” or possibly “Van”: possible Van Allen Bradley?) 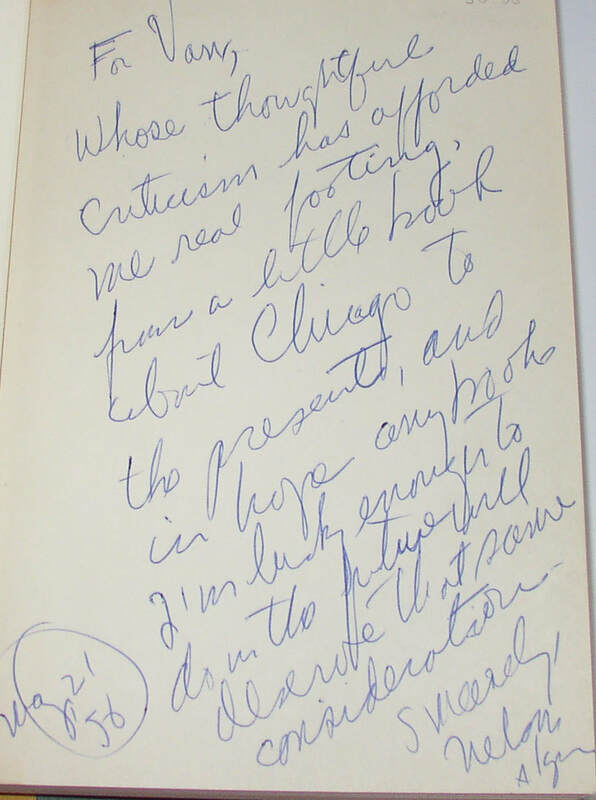 with “thoughtful criticism [which] has afforded me real footing, from a little book about Chicago to the present.” An early inscription for this title, it seems, and a fine presentation copy. Condition: Near Fine/Near Fine, with mild wear to edges. New York: Knopf, 1929. No indication of later printing. Printed yellow cloth. Even without the dust jacket, a scarce book in especially clean condition. Condition: The mildest spine angle, and some browning/spotting mostly affecting the edges of the rear board. ​146. 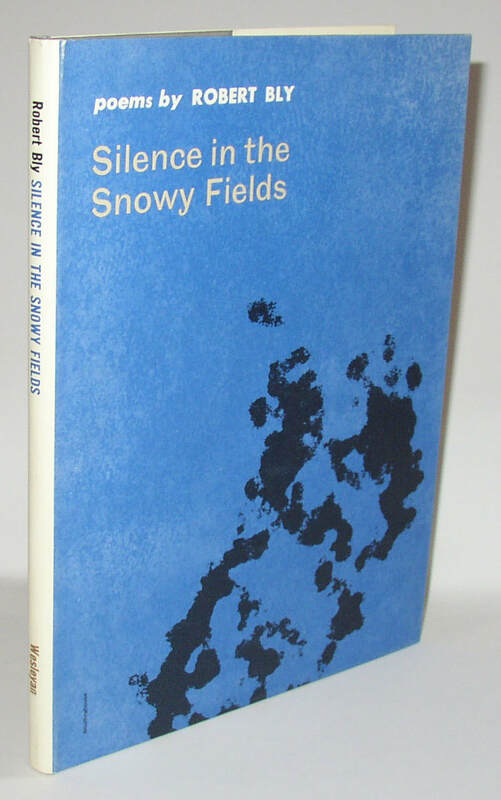 Robert Bly, Silence in the Snowy Fields, hardcover first edition of his 1st book. Middletown, CT: Wesleyan, 1962. Unread copy of the author’s first book. ​147. L. Ron Hubbard, Dianetics, 1st ed. In dust jacket. New York: Hermitage House, 1950 First Edition stated. The first book publication of Hubbard’s Dianetics, which would essentially become the founding document of Scientology. Condition: browning to front end-pages, probably from an old newspaper clipping no longer present. Some surface wear and minor edge nicks on jacket. Superficial droplet spots on fore-edge that do not affect the pages themselves. ​148. 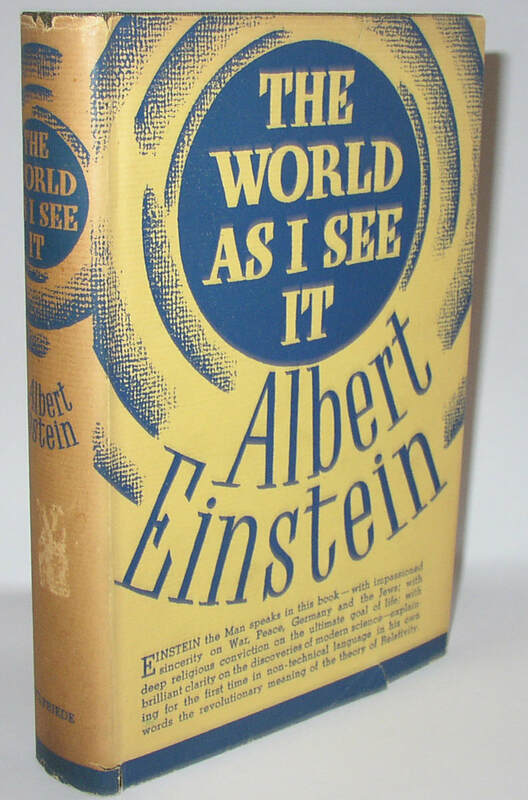 Albert Einstein, The World as I See It, US 1st edition in dj. New York: Covici Friede, 1934. First American edition of this important work from Einstein. Scarce, as a rule, and difficult to find in a dust jacket. Condition: Book is about Fine; jacket with some toning to the spine (and a surface abrasion where a sticker may have been). Some minor tears and nicks at edges. Still very appealing. ​149. 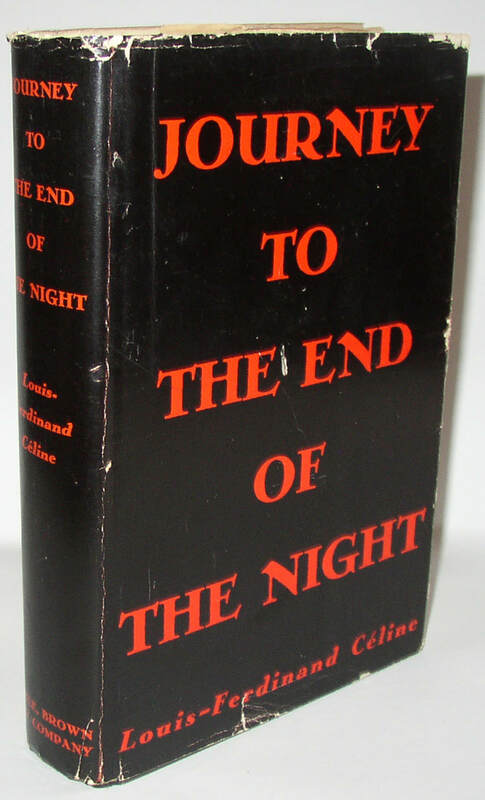 Louis Ferdinand Céline, Journey to the End of the Night, US 1st ed in dj. Boston: Little Brown, 1934. First novel by this author, and the first to be translated to English and printed in the US. Especially scarce in the original dust jacket, as here. Condition: Book is about NF, with occasional corner bends to some leaves. Jacket has wear around most edges, including come chips and nicks, the largest of which is about 3/8”. ​150. 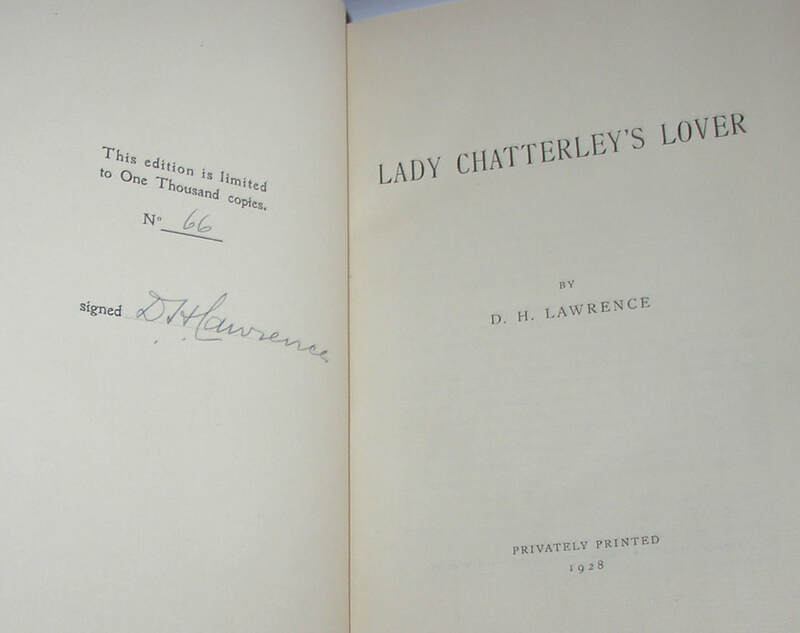 Unopened copy of D H Lawrence, Lady Chatterley’s Lover, signed limited 1st ed (1928). Florence: Privately Printed, 1928. Signed by Lawrence and numbered 66 of 1,000 copies. Pages completely uncut; original plain paper dust jacket complete and in outstanding condition. Surely one of the finest copies of this incredibly important book that remains. 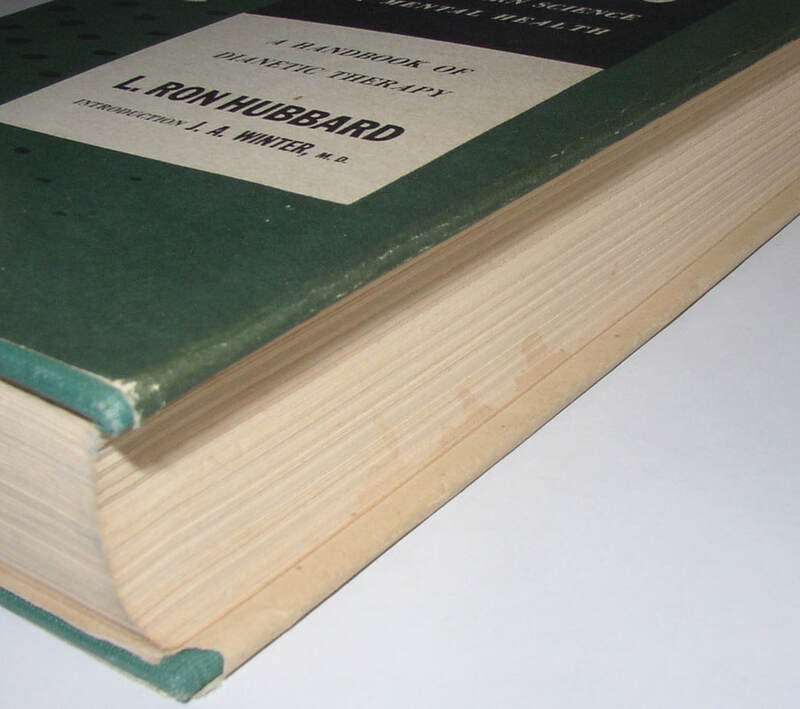 Condition: Book and jacket close to Fine: there is some mild brown spotting (of the sort that usually seems to come from a smoker’s house, though no scent remains) affecting the top couple inches of the fore-edge and a similar range of the folds at the flaps. No spotting on the top edge, though there may be a little on the bottom edge. Really, given the condition of the book as a whole, this spotting is, I think, only a minor flaw. An outstanding collectible copy.